Based in Bloomington, Indiana, FRANKIE & THE WITCH FINGERS drop their cataclysmic 12″ debut tomorrow on Permanent Records. The album is home to a scathing new set of LSD-cured garage rock. After a couple of other early releases (a first cassette on Nice Legs Records and a 4-way split 7″ on Stroll On Records), it’s about time they’ve got a full-length to share. Their record showcases fearless punk snarl with a bright, twangy surf flare, not to mention an added dose of wicked, psych-fueled tones. The LP is rife with sizzling guitars that fall somewhere between fuzzy and wiry, backed by rollicking bass lines and explosive percussion. This all creates a bone-rattling sound and you can feel the elements at work as the ground rumbles beneath your feet. These guys shake out hook after hook and every last one of them has the power to stick to you like glue. “Flower Pedals” sets the tone immediately and opens with a monstrous tidal wave. “Knife Fight” comes with a groovy little hook and it’s as invigorating as they come. Sharp-edged guitars aim for the throat, fortified by trashcan soloing and a bout of ear-piercing fuzz to close out strong. Guitars come with a neon glow in “Revival,” backed by the skuzzed up croon of frontman Dylan Sizemore whose voice recalls the Cosmonauts or even Ty Segall. Colorful synth swells saturate the air as you drift deep into spacey psychedelia. “Lou Reed” is streaked with lysergic, desert-bound guitar rays shining through the murky backdrop. They hold it together with a steady beat as the air is warmed by a cloud of glowing synths. They slow down the pace with “Smiling,” built with cooing vocals and bouncy bass lines for a completely hypnotizing affair. The record officially drops on February 17th (tomorrow). It’s limited to 500 pieces with 150 on “potion pink” vinyl – go here for directions on how to pre-order your copy! 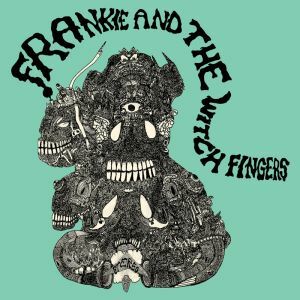 Posted on February 16, 2015 by styrofoamdronePosted in LP, Reviews, Still Spinnin'Tagged 2015, Frankie and the Witch Fingers, Permanent Records, psychedelic, punk, space rock, surf rock.